Heading to the carpet tour: Robert Volhard, CEO Stylepark AG, Petra Blaisse, Inside Outside, and journalist Uta Abendroth at the „Innovations@Domotex“-area in hall 6. We start our tour of the fair at the special “Innovations@Domotex” area masterminded by Jürgen Mayer H. There are zestfully shaped displays for the products that the jury, chaired by Stefan Diez, selected as being especially innovative – and which are on show here in addition to being on the respective company booths. 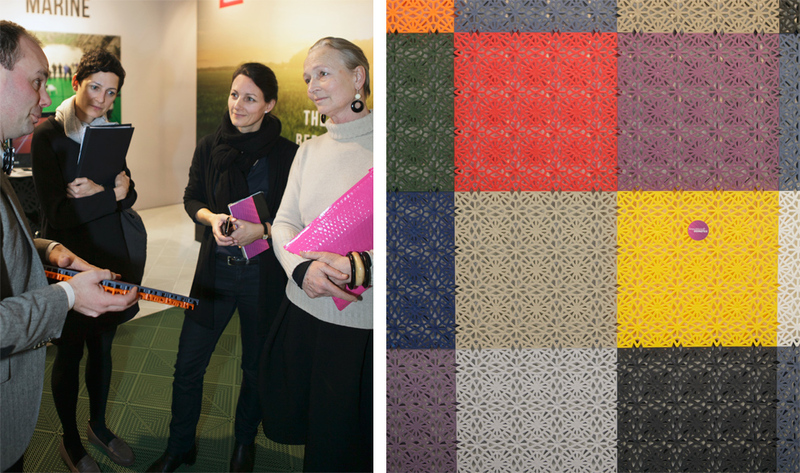 Petra Blaisse is at the Domotex for the first time and looks around with interest. 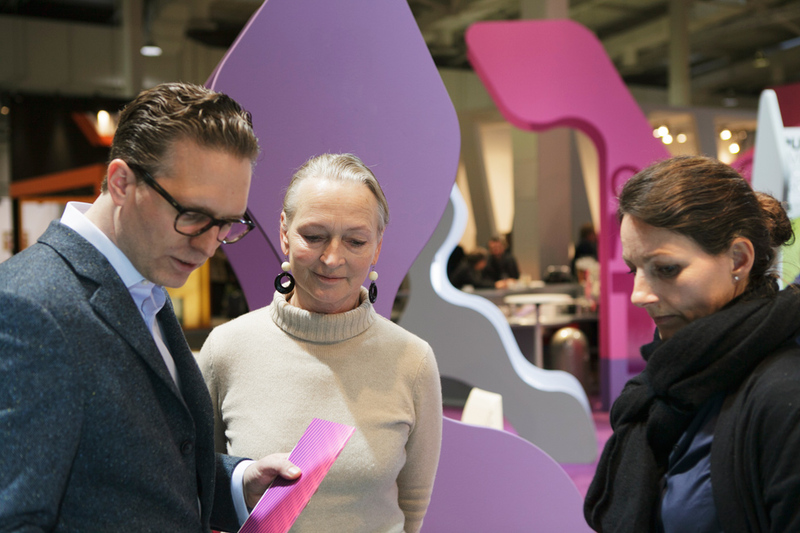 Uta Abendroth: What’s your first impression of the trade fair? Petra Blaisse: It all seems so airy and spacious. I’m intrigued to see what the tour brings. It’s great that you can see so much at once and it’s all a hands-on experience. Abendroth: This is your first time at the Domotex. How have you familiarized yourself with floor coverings to date? Blaisse: We tend to visit the manufacturers and find out what they have on offer. After all, the products don’t get sent to us at the office. You can choose any number of things on the Internet, but it’s not like you have all day to do that, either. And sometimes you don’t really get a feeling online for a material’s actual qualities. The advantage my generation has is that we have a fundamental understanding of materials and the possibilities they afford – and a lot of experience, too. But often enough we’re focused on our own projects and miss the one or other development or innovation that could be of interest. At any rate, an event such as this expands your horizons. 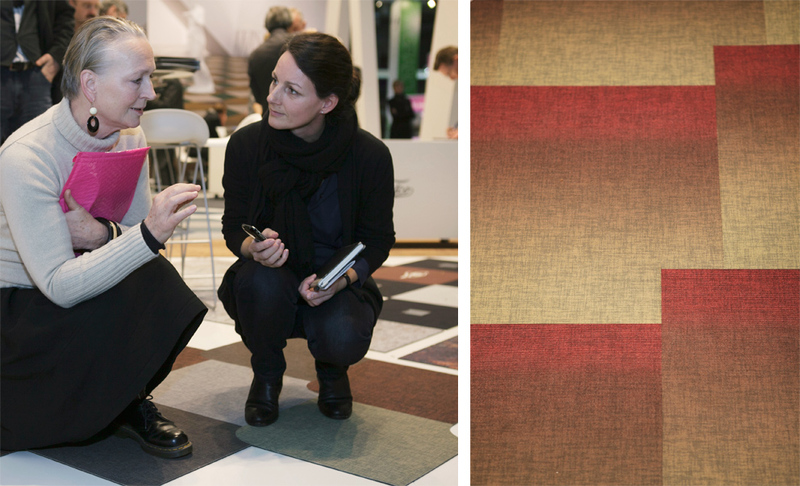 Abendroth: We’ve just seen a small version of Sebastian Wrong’s carpet tiles for Danish manufacturer Fletco at the “Innovations@Domotex”. Here on the booth they’re on display in a larger format and with various different patterns. What’s your take on this design? Blaisse: Carpet tiles – were they ever a topic for designers? Now these here are really special in terms of color and shape. And they have a very shallow pile, meaning you can clean them swiftly and easily. They are therefore suitable even for public premises, such as libraries. Carpet tiles are a good alternative to other floor coverings when outfitting such places, as the small pieces can easily be replaced at will if something really gets trashed or is too dirty. And that has a lot to do with sustainability, which I feel is really important. the size of surface can’t be divided up exactly? Lindén: You cut the tiles with an electric knife to fit perfectly wall-to-wall. Born in London, Blaisse is Dutch and designs textiles for both indoors and outdoors, for example carpeting with a striking pattern for Rem Koolhaas’ Seattle Library: Blaisse opted for photorealism, strongly enlarged leaves and grass, which she photographed in her city garden in Amsterdam and then had printed on the textiles. Since she links interior design and landscape architecture in her work, Petra Blaisse is particularly interested in outdoor products. We have now progressed as far as the booth of Sweden’s Bergo Flooring, which is specialized in developing and manufacturing plastic products for the floor. Abendroth: I guess this will interest you: These plastic tiles are suited for outdoor use. The variations include a burled or smooth surface, countless different colors, and even with tennis court markings. Blaisse: That is indeed an article I find very practical. I’d like to learn more about it. Emil Lindén: Well, Bergo Flooring developed this extremely robust tile using granulates made of recycled plastic of the kind used to transport vegetables. They’re good for extreme heat or cold, UV light and even withstand high loads – up to 6 tons across 10 by 10 centimeters. This plastic floor covering can take a lot of punishment. Blaisse: And how do the individual sections get laid or connected? Lindén: As you can see, there are small rings on the back of the tiles, into which the counterparts on the next tile fit. Using a rubber mallet you simply tap the surface into place – laying Bergo Flooring products requires only a matter of minutes. We offer two different sizes, 30 by 30 centimeters and 38 by 38 centimeters. Using the larger one, you need exactly seven tiles for a square meter. If the floor is level and smooth, then you can lay these tiles very swiftly. For tennis courts we offer prefabricated panels sized 1.1 square meters. Take 600 of them, start in the morning, and you’ll play tennis by the late afternoon. Blaisse: And what happens if the size of surface can’t be divided up exactly? Blaisse: I like the idea behind the product but the result doesn’t look that good. If a designer were to have been involved, then I guess the product would have had a significantly improved quality look. The tiles have a very unique aesthetic, though, a bit like lace. In passing, in the course of our tour we see extreme carpets with strident colors and brash patterns. Blaisse: These “loud” carpets are so awful that that they’re almost good again! We’re so subdued with our European tastes, whereas the Arab and Asian worlds are quite different. That’s what is so tough about our job: If you work for so many different cultures you have to remember that each possesses a different inner attitude to taste, or quality, or the use of color. You really have always to think your way back into each project again, depending on where you are and for whom you are working, and adjust the design accordingly. Initially, when you’re young, you may fear losing your own signal style. But experience soon teaches you that this doesn’t happen, as you always have the ability to influence things and there are many aspects where as a designer you remain free in your decisions. We’ve just got as far as the Papilio booth, a Belgian brand. There’s a lot of enthusiasm for the floor covering that lies in the entrance area. Blaisse: That looks really unusual. What’s the carpet made of? Kim de Cabooter: Old fan belts, actually, knotted together using polypropylene yarn. A very rustic look and the product is very robust. You can use it indoors or outdoors, as you like. Blaisse: I like it, as the new product tells the story of something that went before. It’s a bit unusual to walk on at first, but the carpet really looks great! Blaisse: It’s marvelous. Gotta take a few pics! It’s very fashionable at the moment, this combination of different materials and different colors. De Cabooter: We’re constantly rethinking what materials can be recycled this way. But we also have a unicolor flooring such as this thick crocheted “Pura” carpet – it takes about eight days to make by hand. Abendroth: So these carpets convince you? Blaisse: I don’t find all of them beautiful, but the company’s trying out everything in terms of different materials and techniques. Seeing something like this is worthwhile, as it’s what we’re always doing, too: using existing textiles to create something new by changing them. 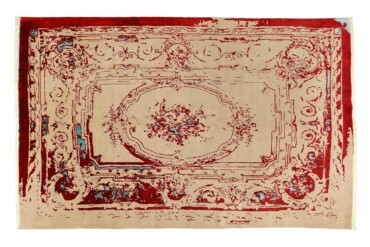 I could well imagine using Papilio carpets for the interiors of private homes, for examples. 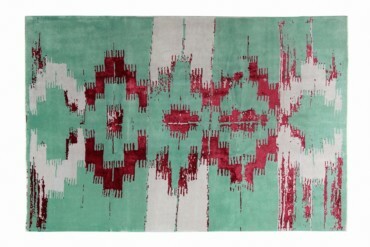 We head for the modern handmade carpets in Hall 17. Our first stop here is Rug Star, the label of Berlin’s Jürgen Dahlmanns, where silken gleam and elegant patterns adorn things. Jürgen Dahlmanns: I’m inspired by Art Nouveau and Art Déco, have rediscovered them. I believe the yearning for patterns will increase over the next few years. Blaisse: Hmm, I’m not so sure, but maybe you’re right. At any rate, your carpets are beautiful when the light shines on them. A bit as if they were under water, everything seems so abstract, and yet you have the illusion that the pattern is a drawing. How do you achieve that effect? Dahlmanns: Our blanks are knotted in such a way that the background is always a natural gray and the patterns use different special silken tones. These are oxidized 20 times, washed and polished. We call this “zero pile”: We always cut 0.3mm off the pile to eliminate the entire wool bulk. One example: This carpet here was originally mauve before we removed the pile by oxidation and polishing. If the incoming light changes, the color re-surfaces. And you get the contrast between gleaming and satin. Which is beautiful and mysterious at once. Blaisse: The carpets seem to have a patina. And they have a clear direction, like velvet. I can well imagine how the color and the sense of depth change with the light. And surely natural light will have an effect unlike artificial light. 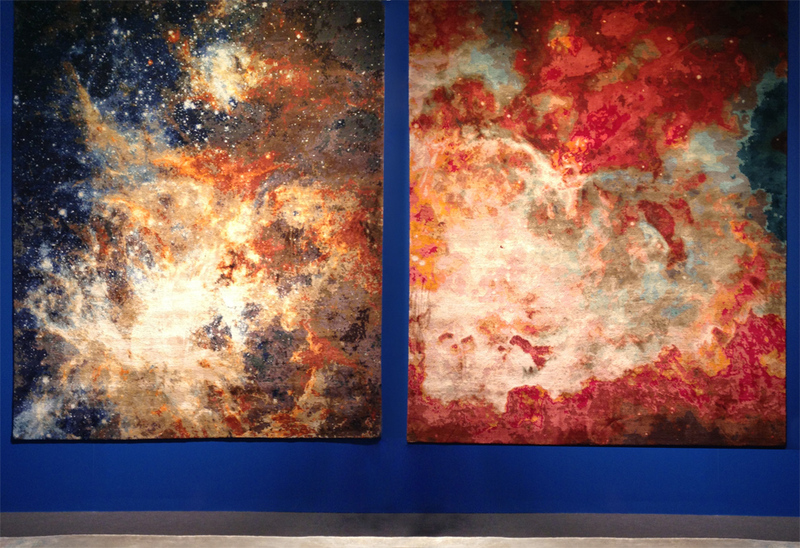 Dahlmanns: In fact, carpets are an opportunity to reflect the ambience of the place or the light in the space. It’s a kind of parabolic mirror. And the higher grade the material, the better the effect. Blaisse: How long do you need to make one of these carpets? Dahlmanns: That depends on the region in which the carpet is made. Tibetan knots are made using three threads, which is faster and therefore cheaper. Persians always use one thread, which means knotting the carpet takes longer. A higher-end Tibetan of a standard 250 by 300 centimeters will require about 16 weeks to make; a comparable Persian will take as much as 22 weeks. There’s a second special “Innovations@Domotex” area in the middle of the hall. Here Jürgen Mayer H. has hung exhibitors’ carpets in a circle from rods that resemble carpet rods. Petra Blaisse stops next to a round white model that is adorned with small bobbles and strokes the surface. It’s a “Floor to Heaven” carpet by Michaela Schleypen. The designer drew her inspiration from a sea urchin. We visit her booth. Blaisse: I just saw your sea-urchin carpet in the special area – it’s very beautiful! How did you achieve the 3D effect? 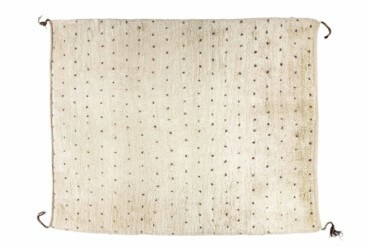 Michaela Schleypen: My carpets are tufted in India. The fibers are underlaid from behind and, then, and this is the way I always put it, are then sent to the barbershop. We’ve developed special small tools to that we can tuft and stitch the remarkably fine way you saw. In the sea-urchin carpet what you get are those knobby bumps. It functions with every pattern as it is sheared by hand after the event. The 3D feel can also be achieved using different stitch heights. Blaisse: Yes, but a lot is down to the colors. Schleypen: Yes I play with the colors, sometimes imagining underwater worlds, and then take an idea and turn it into a stylized piece of coral. Blaisse: Are your carpets also fit for outdoor use? Schleypen: Yes, the products from the Neon Outdoor Collection are. And if they get dirty, you can simply pressure-hose them down. However, they can’t be left next to the pool forever as they have to dry out properly now and again. Blaisse: That’s of great interest for my company as countryside and interior are already merging in the products themselves. When walking through the hall we chance by Hossein Rezvani’s stand. 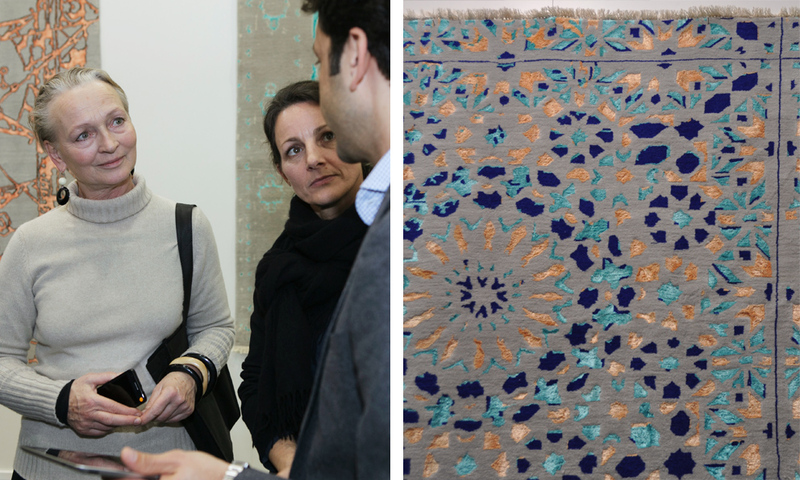 One carpet catches Petra Blaisse’s eye as it reminds her of the faded walls of Roman ruins. 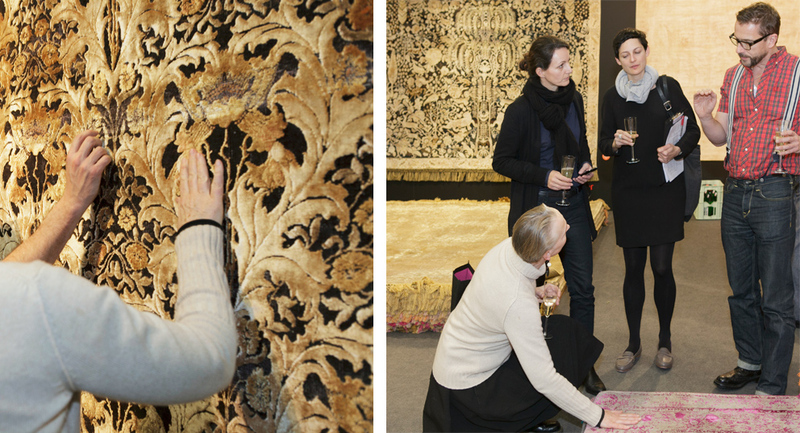 Our tour ends at Jan Kath’s impressive booth, and just because of the sheer number of carpets on display. Blaisse: Wow, you’ve got a lot on offer! Jan Kath: Yes, but the carpets here are only specimens. We only make to order. That way, colors and sizes can always be changed to fit exactly what the client wants. Blaisse: So you have different collections? Kath: I tend to work on many different themes at once. The “Space Crafted” collection is based on NASA photos, while for another carpet I used an aerial photo after the collapse of the “Deepwater Horizon” oil rig in the Gulf of Mexico, and for “Bright to Cloudy” I looked at lots of paintings, including ones by the Dutch Masters. Blaisse: I’m proud of that source of inspiration! How do you process the images? Kath: I translate the photorealism into knots: You can see a knot as a pixel. If the image or file is high-res, then we translate it at a computer and can then work in a photorealistic vein. Abendroth: Are all the knots the same or are there different types? Kath: You can only use one technique per carpet. Although I once combined two highly different techniques that usually have nothing in common in a single carpet. I used hemp for a flat weave and then used silk. That way I had two diametrically different materials united in one piece, as I was interested more in the texture than the design. Blaisse: Silk is beautiful, such marvelous colors. How many colors do you use? Kath: We have our own color system. Our standard palette includes around 1,200 colors for wool and about 700 tones for silk. They can be combined with each other and if they don’t have the right nuance that a client or architect we work with wants, we can create new colors on the basis of their specs. We use Swiss aniline colors for this. Blaisse: You do it all yourself? Kath: Yes, I spin the wool and the silk myself, we dye things ourselves, and I even do knotting. We have a total of 2,800 people working for us, 40 of them in Europe. Depending on the materials, style and tradition, the carpets are made in Nepal, India, Afghanistan, Thailand, Morocco and Turkey. We end our tour and take a moment to absorb things. 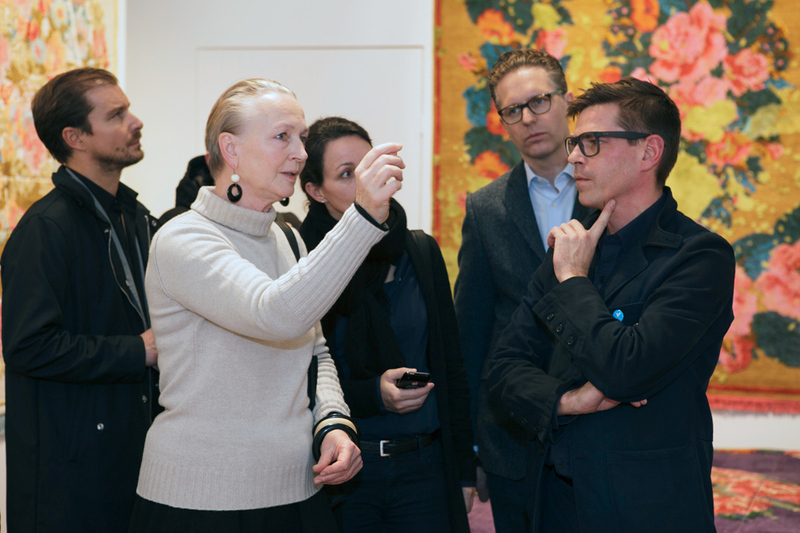 I ask Petra Blaisse to summarize her first visit to the Domotex. Blaisse: I found the tour very inspiring for various reasons. We saw a wide range of products, for example the more commercial items such as the so-called plastic carpet made of various small sections, and the plastic floor tiles. Both set out to make an attractive product, whereby the former have consulted a designer. Both focus on a large market and the companies talked about time. I found that interesting as time and efficiency are always an issue. Everyone in our business knows that things have to be done quickly. Be it offices, commercial premises, sports facilities or the like. You have to be able to change things quickly, put them in place one day and remove them the next, and they have to be easy to clean. And there’s fire protection and acoustics to consider. Abendroth: Meaning practicality before beauty? Blaisse: Not necessarily. As a designer one starts imagining things. You think, hey, this product is the basis, it’s what the company makes. But if I give it this little tweak… I’ve then got an idea how to influence the manufacturer and turn the one or other product into something more beautiful. Sometimes you only need to change the context, use the product in a completely different way, or turn it over and use the back. It’s always interesting for a designer to interact with a manufacturer. Abendroth: What other topics come to mind? Blaisse: The manufacturers are very committed to sustainability specifically with the plastic products. And to re-using, breathing new life into existing materials. Using old leather and rubber is not a new idea, I’ve seen it before. But the way the Belgin company mixed it with natural fibers such as hemp and jute so that you can see the traces of the first life in the products, now that I liked a lot. 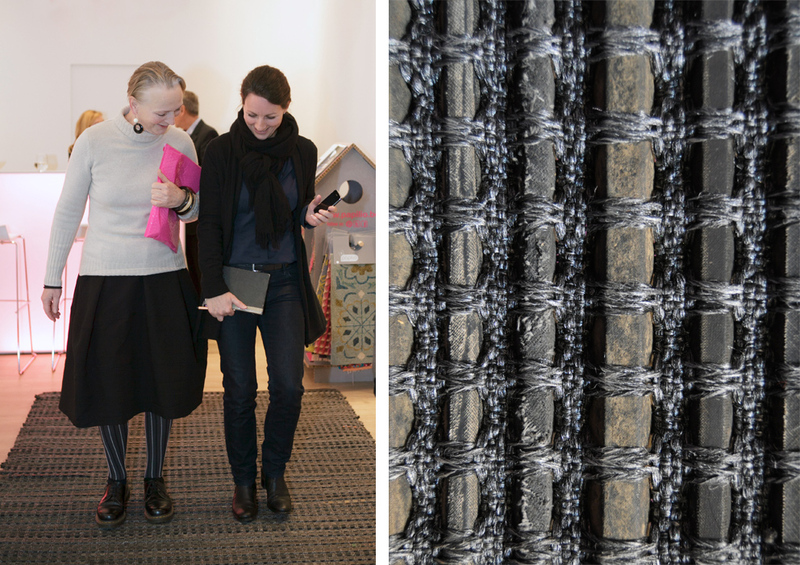 Abendroth: And a word on these modern carpets? Blaisse: Now they really took me by storm. I’m really impressed by how those creative minds turn carpets into genuine works of art. The techniques of knotting and then covering over or taking fibers out, it’s almost like painting with the numerous layers of paint. However different the carpets were in terms of style, the makers have something in common: They immerse themselves in a culture, “process” it, and then create handmade gems, relying on the know-how and craftsmanship of the respective local staff. It’s kind of about a different time or different sphere, where the new and the traditional coalesce. Abendroth: Would you come back to the Domotex? Blaisse: Definitely! I’s return as a designer who doesn’t do carpets but wants to collaborate and can learn from others. Perhaps to embark on a new collaboration, who knows. As said, many of these products I wouldn’t use directly, but if you give them another spin or use them in a slightly different way, then they’re exciting. At any rate, I think many of the people here are real artists and I feel inspired. Ms. Blaisse, many thanks for your time!